Because why should the fun stop at breakfast? Skewered eggs, anyone? On the streets of Thailand and Laos you’ll find whole eggs on the grill. It’s something of an art form: Before the eggs are grilled, the inside is blown out, beaten, seasoned—and then put back into the shell. It’s not easy, but it sure is tasty. A British picnic classic. Take a boiled egg, encase it in sausage meat, coat it with breadcrumbs, and fry until golden brown. 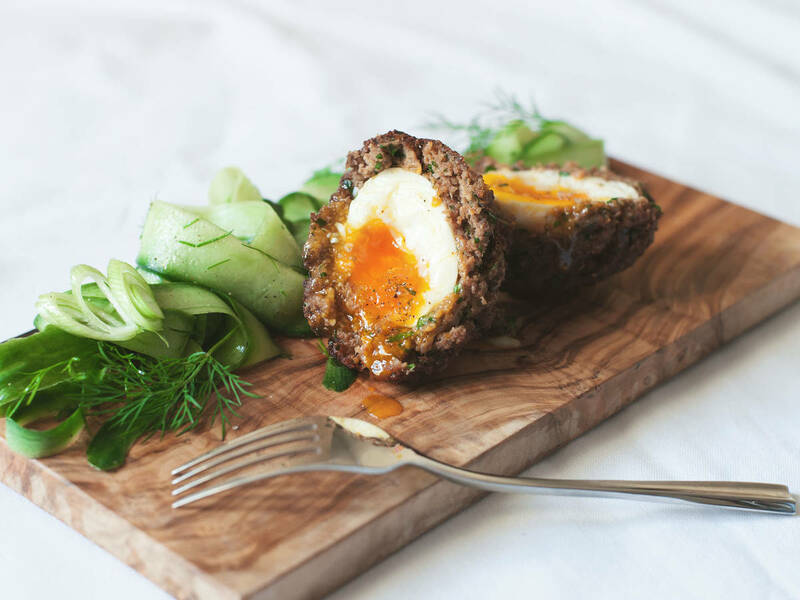 These crunchy egg-meatballs taste as good warm as they do cold – when the British weather isn’t fit for eating al fresco, they are enjoyed in a pub with glass of ale. If you’re a fan of scrambled eggs, you’re going to love this Turkish version named after the city of Menemen. Onions, bell peppers, and tomatoes are all added to a frying pan. When the tomatoes are tender, eggs are stirred in and seasoned with salt, pepper, and paprika. For some they are a delicacy, for others a test of courage.. But they don’t really take centuries their name suggests. Duck, quail or chicken eggs are wrapped in a paste of wood ash, chalk, tea leaves, water, salt, and lemon juice and stored in a clay container for approximately 45-90 days. As it preserves, the egg white turns into an amber-colored jelly and the yolk becomes creamy and dark green. According to legend, the first century eggs were dug up some 600 years ago during the Ming dynasty: Ducks were said to have laid their eggs on a chalky building site and discovered later by the amazed house owner. If you’re not quite feeling brave enough for the experiment, try starting off with Chinese tea eggs. Avgolemono means ‘egg and lemon’—key words for this chicken soup variant. A raw egg beaten with lemon juice is added into the broth with cooked rice and immediately removed from heat to prevent the egg from curdling. Avgolemono is a soup for every season: Fresh in summer, warming in winter. It’s said this dessert was invented by accident. An apprentice was preparing crêpes for the future king Edward VII when the syrup, made with liqueur, caught fire. To save the day, he dipped the crêpes into the fiery marinade and served it as a brand new creation in honor of the Prince, who name it after his guest Suzette. Though there are versions from all over, we love this Danish recipe. In Copenhagen, egg salad is made with shrimp, smoked salmon and fresh herbs, mixed with boiled eggs and a sauce made of mayonnaise and cream. Eat it on its own, or spread on Danish rye bread like the locals. Crema Catalana is the sweetest way to make use of half a dozen eggs. A mixture of cream, sugar, and vanilla is beaten together with six egg yolks. It’s then poured into ramekins and placed in a larger baking dish filled with boiling water to steam in the oven. Heavenly!